It would seem that there are a lot of woodcarving sets on the market which contain some very useful tools but will also feature some which you will hardly use at all. 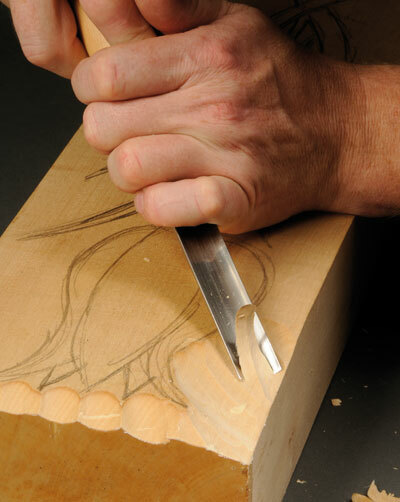 With this in mind, many carvers tend to buy their tools individually, but this can prove costly for beginners who aren't quite so sure what they should or should not have in their collection. Enter the Art Base set, put together with the aim of correcting this dilemma. Consisting of six tools with two optional extras, the set is designed by Peter Benson, teacher of woodcarving and chairman of the British Woodcarver's Association (BWA), with tool manufacturer Ashley Iles. 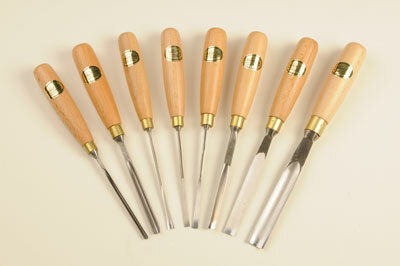 They are intended to be a comprehensive set featuring tools which carvers will often use. The two recommended additional tools are the No.39, 60 degrees 1/4in V-tool and the No.11 1/8in veiner. Both are available from Ashley lles. The length of the blades and handles are designed to be comfortable to the user and affords optimum control. They were supplied to us ready to use - sharp and with no extra honing required. Open the pack, remove the end seal and away you go. This was a real treat as so often tools are manufactured by someone who doesn't quite understand woodcarving and as such, they are not ready to use without personal honing. Ashley Iles, however, understands the requirements of woodcarvers and so it really was no surprise to receive such a finely tuned set. There are gouges in the set which can be used for quick bulk removal of wood and others designed for fine detail. As one would expect from Ashley Iles, the tools performed superbly. I was able to achieve quick and very pleasing results on my test piece. They really are a joy to use, so much so that I will be sad to see them leaving the workshop - I can't often say that about carving sets. The set is well thought out and very finely made. It certainly is something to put on the Christmas list for goodies... far better than another pair of socks, handkerchief or a scarf! "The set is well thought out and very finely made"